The 22th ECAD Mayors Conference was held in Malta on the 11th and 12th of May 2015. The conference theme was how we can prepare ambitous and comprehensive drug policies in our cities and nations in preparation for UNGASS 2016. The presentations given during the conference aimed to shed light on various aspects of the drug problem and give practical examples on how our cities can better adress their drug problems ahead. 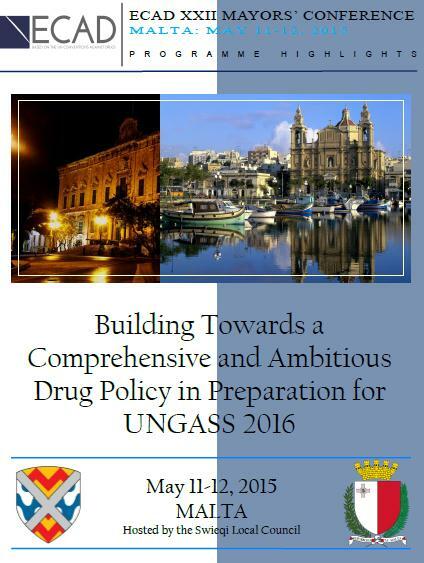 # 5 Drug Policy Futures: What is ECAD doing to Influence Drug Policy Ahead? In preparation for UNGASS 2016"
Preparations for the 22nd ECAD Mayors Conference hosted by Swieqi Local Council, Malta are in the full swing. Save May 10-12, 2015 for professional networking in Malta! Conference programme is being set up at the moment and ECAD will continuously update you on the latest details. The Grand Hotel Excelsior, a 5-star hotel in Valetta is the Conference Venue. The hotel is situated in the capital of Malta, the city of Valetta which is a UNESCO World Heritage Site. 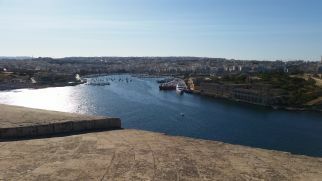 It can boast with magnificent accomodation, breathtaking views of Marsamxett harbour and Manoel Island and also allows for easy travel to all parts of the Maltese islands. 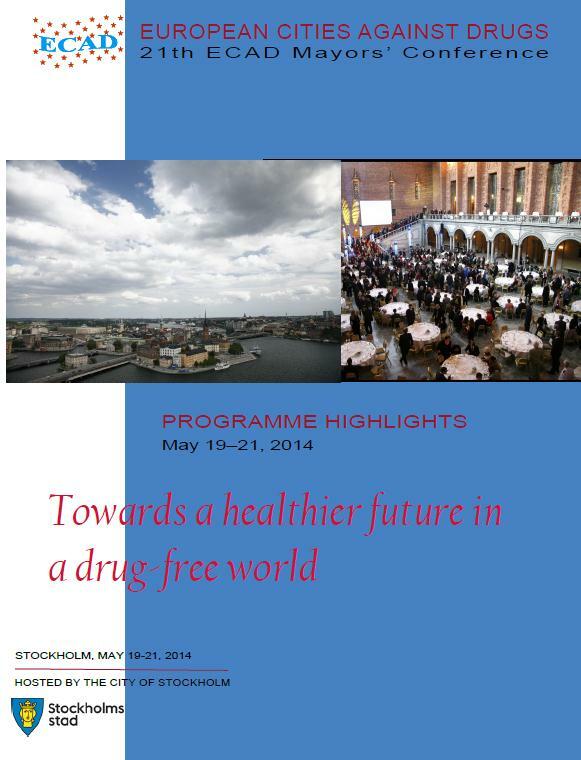 "TOWARDS A HEALTHIER FUTURE IN A DRUG-FREE WORLD"
ECAD prepares for you a nice document folder with the detailed conference programme, an invitation to the buffet dinner at the Stockholm City Hall, speaker biographies, Stockholm map and latest ECAD publications. All the printed materials will be for your avail by the conference hall, if you need an extra copy. As a registered ECAD Mayors´ Conference participant this year you contribute to the work of a small non-profit NGO "Maskrosbarn" that offers support for teenagers growing up with parents having addiction problems or mental illnesses. "Maskosbarn" (or Dandelion children in English) arrange camps, hold lecture and activities for youth all over Sweden. Your contribution is a small sum that is traditionally used for purchasing giveaway pins, pencils or any other unnecessary items. You will receive a certificate of appreciation for your support to Maskrosbarn in your document folder. Welcome to our major event in support of the UN Conventions on Drugs! In three months, ECAD and World Federation Against Drugs, WFAD, will host two important conferences in the same premises of the Munich Brewery in the southern part of Stockholm. Conference venue is specifically chosen to accomodate a vast number of delegates and it is important to book your hotel a good time ahead. Quality Hotel Globe is a modern conference and event hotel situated next to Globen in Stockholm. 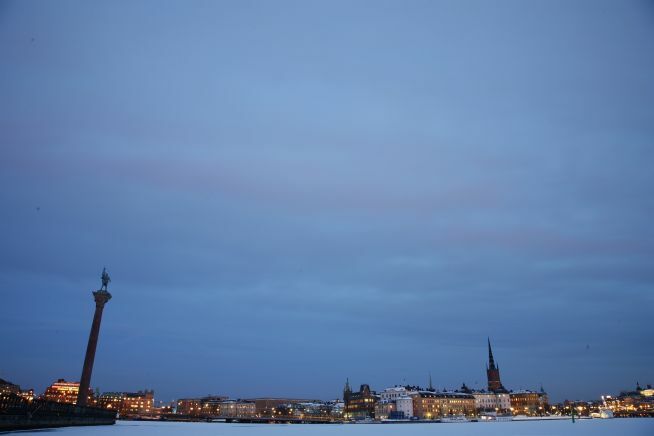 Ideally located besides the events complex Globen, the hotel ensures an exciting and memorable stay in Stockholm. Scandic Malmen is a functional hotel in the middle of the Southern part of Stockholm, Södermalm. The hotel is conveniently close the Underground station Medborgarplatsen. The price per single room / night is 990 SEK during the Conference days.